Marcus Kawatachi has worked almost his entire career at the Hawai`i Civil Rights Commission, the agency that enforces the State's antidiscrimination laws in the areas of employment, housing, state services, and public accommodations. He currently serves as the Deputy Executive Director of the Hawai`i Civil Rights Commission, providing direct supervision to its legal and investigative staff. As a member of the HACBED board Marcus hopes to continue to assist individuals and families in creating opportunities to live their lives as they choose. He is a proud graduate of Princeton University and the William S. Richardson School of Law. Kaipo Kukahiko is the Executive Director of the Kualoa-He’eia Ecumenical Youth (KEY) Project based in Waihe’e, O’ahu. Since 1968 KEY Project has provided programs, services and activities to everyone from keiki to kupuna at their campus on Waihe’e Road. Through community partnerships and collaborations with other organizations, KEY Project provides a solid foundation for community connectedness for Ko’olaupoko and beyond. Kaipo is a proud graduate of the Myron B. Thompson School of Social Work earning his MSW in 2012. 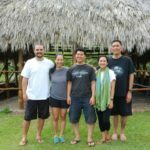 Most recently he spent two years with the Consuelo Foundation as a Program Officer before making his way back to his ‘aina hanau and to KEY Project. Trina Orimoto is a clinical and research psychologist, specializing in child and adolescent mental health. She is passionate about partnering with and protecting youth and families in local community systems of care. Miwa currently serves as Deputy Director of local non-profit Kuaʻāina Ulu ʻAuamo, where she is blessed to work in the service of rural community leaders advancing their collective and abundant vision for their one hānau (ancestral lands). Previously, she has served environmental and economic justice efforts in non-profit, private and public sectors, including as Executive Director of local non-profit KAHEA: The Hawaiian-Environmental Alliance. Miwa received a M.A. in Economics from the University of Southern California, and lives with her husband Kamuela and two young children on the Leeward side of the island of Oʻahu.